Most of my free time these last weeks I found myself at the studio, waiting for customers or having the studio rented for rehearsals. So I did make use of it. Production of the soundtrack advanced quite a lot, so did a lot of the environmental sound design. 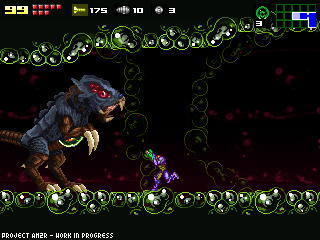 Areas 2, 3 and 4 have many mechanisms (and robotic enemies) that were silent, until now. Also, a feature I experimented a couple of months ago with, might end up being an actual feature of the game: Sound Effect sets. Some games have different "ambience" sets for any sounds that are played in certain areas (like echoes in caverns), I recently gave it another try, and I was able to come up with a way of doing just that, without major slowdown. The performace is still being tested in several systems, and it might end up being an optional feature. Anyway, if you're looking for the links that used to be in the right pane of the Blog, they are now found in the Metroid: Confrontation page, up here. I also added dedicated pages for general info about the project, and the Demo. Finally some decent progress on the ambiance and music. as i recall, that was the one category that suffered most. glad to see that it's been worked on to some degree. Keep going, your doing awesome. Can't wait for the finished project. Im sure it's going to be Sweet. First comment: dude, I think your doing great. You have mad skills. God bless you and your baby. Can't wait for this thing to come out. Keep up the good work doc. Ok...sigue así, oh, y ¡¡¡Feliz día del padre!!! Que bueno ver progreso, muy buena onda. Queremos escuchar la musica nueva! Hey doc, I have some suggestions for you: You should have a twitter and facebook dedicated to this game! ALSO, you should offer an email subscription service, so whenever you post a new blog, all subscribers are notified via email. Not to bring a downer on everyone, but you DO realize that once your project reaches 80-100% completion, you're going to get slapped with a CAD latter, just like every other awesome remake project that was floating around for a time (Chrono Trigger 2, Streets of Rage Remake, the Mario PC game, Atari Adventure remake, etc.). Just in case, you might want to have an alternate delivery method of providing the game set in place once it's finished. I agree with Jonathan Shine. Keeping track of the blog is hard for me, sometimes I forget to check the blog for months. I'd like to subscribe to you. Making a Facebook page is also a great idea, many bands/projects are using it nowadays. Dude, you know what? I love you. Yeah, there, I said it. To you guys asking for an e-mail newsletter, may I introduce you to RSS feeds? I'd really enjoy if still this year the game was ready. It's funny that nowadays I play a PS3 (soon I'm buying a Wii or Wii U) but this "simple" graphic game attracts more than the very most modern games I have. Fun and creativity are a lot more influent than technology. Sou fan de Metroid. comecei a acompanhar seu projeto. Continue trabalhando nele. Estou ansioso para jogar. When the project is done, will you release the editable file? In the spirit of all of the metroid rom hacking, I think it would be a good idea for you to release it. It would also be a cool way for newcomers to get into serious work with Game Maker. It's been an awful long time since an update. "Gut Ding will Weile haben" as we say in Germany. Can you give us an update? I feel worry that its already been over a month since the last one. Hey Doc, are you going to add Facebook and Twitter pages for AM2R? It's been a little bit since even a comment was added. You okay?